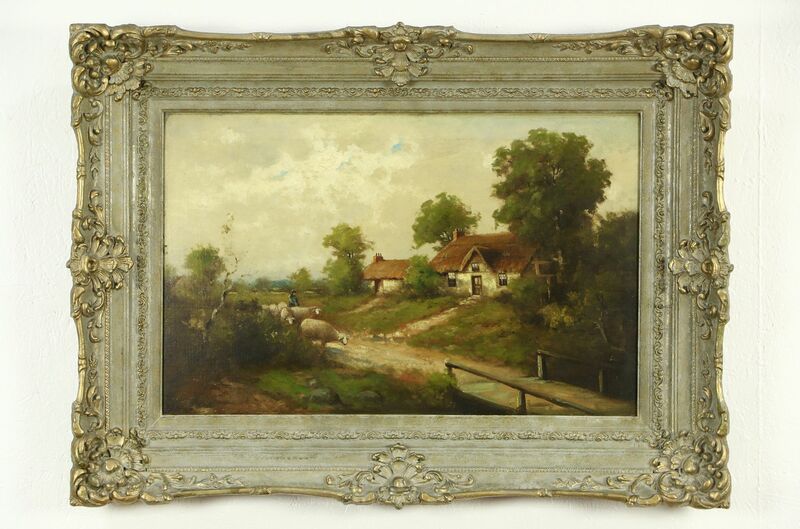 A bucolic scene of a thatched cottage and sheep is an original oil painting on board. Although this picture shows great artistic mastery, we can find no signature on the front. Sealed with glued paper, we have not opened the back for any more clues. The subject appears English, and age could be about 60 years. The deeply sculpted frame is in very fine condition on this work of art. There is a tiny dimple at the center of the left edge, see photos. Overall size is 38" wide, 28" tall and 4" deep.